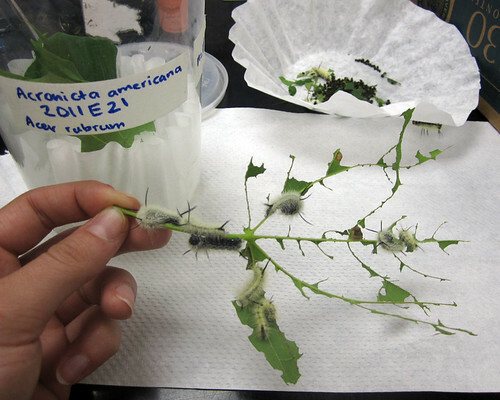 My A. americana caterpillars sure can eat! They have been one of my favorite species from the start. First of all, their eggs were much larger than the others, and they hatched almost twice as large as the other caterpillars I’m rearing! At first I thought it must be a mistake, but indeed, I had measured them just after they hatched. They have always had big adorable heads, and of course now they are piling on the fuzz. They are in their fifth and sixth instar now, I wonder how many instars they have total? I am starting to consolidate my notes and measurements and photos, creating a panel of images to show the changes as they grow. It’s satisfying to already have some “results”. And more eggs are on their way! A few species I have not reared yet. So now that my current babies are getting older… time for a fresh batch of eggs and hatchlings. I’m certainly going to keep busy this summer.